Bales of hashish at the Cartagena seaport seized by Spanish Civil Guard off the coast of Murcia. Photo: Guardia Civil/AFP. Spanish police are struggling to contain extremely organized crime networks in the narco-hub town of La Línea, just north of the Spain-Gibraltar border. A Spanish coastal town of under 65,000 people is the entry point for 80 per cent of the hashish resin consumed annually by Europe, claims a report by northern Spanish daily La Voz de Galicia. At least 280,000 tonnes of hashish arrive via La Línea de la Concepción, known simply as La Línea, every month, according to one anti-narcotics officer interviewed for the report. The officer estimates that smugglers drop off 2,000 kilograms of hashish seven times per night, 20 days per month. According to the paper's sources at the Guardia Civil, the police are able to recover just under four per cent of the estimated total import volume of the illegal drug. 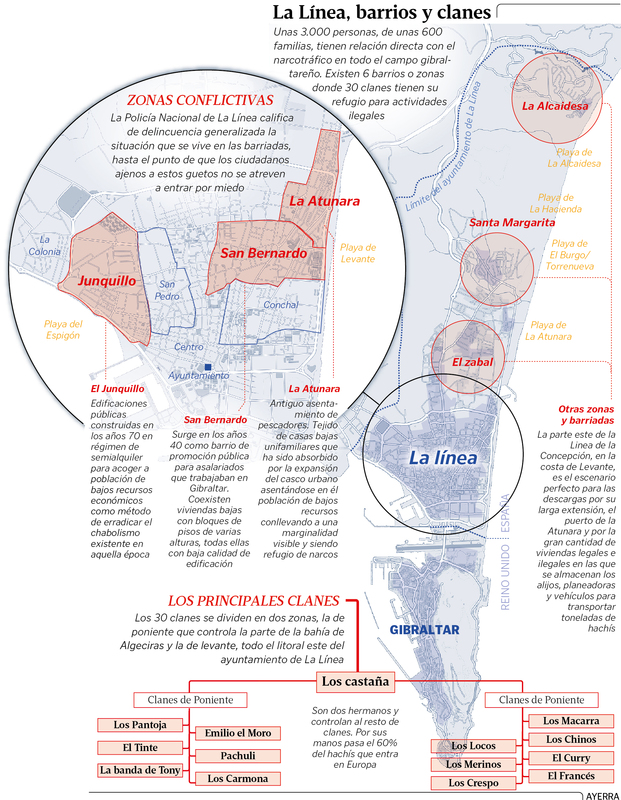 Around 3,000 people from 600 families work for 30 or so clans in six districts of the town of La Línea, directly north of Gibraltar, according to a La Voz de Galicia graphic. Local residents say the are scared to enter certain districts. In February 2018, an alleged clan boss was broken out of hospital by armed men and ferried to Morocco for treatment after being injured in a chase with police. The man's bodyguards allegedly intimidated local police officers who were guarding the suspect, reports the daily. More than 60 per cent of the total hashish imported via La Línea is said to be under the control of the Castaña brothers, described by an unnamed Guardia Civil agent as the "largest movers of hashish in Europe." This handout pictured released on January 21, 2018 by the Spanish Police shows hashish sized at a house in La Linea de la Concepcion, southern Spain, after the police dismantled a network that trafficked hashish from Morocco to Spain, using a radar system to detect the location of boats or helicopters of the authorities. Photo: Spanish Police/AFP. "I have had to leave my house many times via the roof so that I would not be seen by two thugs watching me at the front door," the officer told La Voz de Galicia. In February this year, Spanish police dismantled a Spanish drugs cartel in Galicia that ran 150 warehouses and businesses in northern Spain to import cocaine from Colombia. Besides the seizure of over 5 tonnes of cocaine in two years, officers also seized boats, real estate, financial companies and millions of dollars in assets in the February raid in Galicia. In 2017, 145,372 kilos of hashish were seized by Spanish police compared to 100,423 kilos in 2016, according to an earlier report by Spanish daily El Pais. This represented an increase of 50 per cent, a worrying upwards trend. The Madrid daily argues that the strength of the drug cartels in La Línea is linked to a 33 per cent unemployment rate in the area. A prosecutor told El Pais that the drug traffickers'' "infrastructure is far superior to ours."